The 3/8" slim-line housings are designed for easy under-sink installation. Ideal for taste-odor and sediment filtration. Designed for marine, RV and home applications. 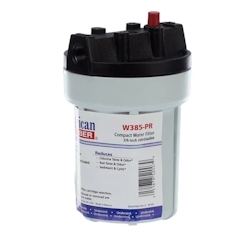 Can replace the The Culligan US-316 water filter system. Inside Diameter: 3-3/8", Outside Diameter: 3-3/4"